My little friend (a Cope’s Gray Treefrog or Hyla chrysoscelis) has not been seen since July…when I hung that impressive snakeskin on the bulletin board in the greenhouse. And I’ve missed him! But yesterday after taking lavender cuttings ,in an effort to “make more plants” (thank you Ken Druse!) 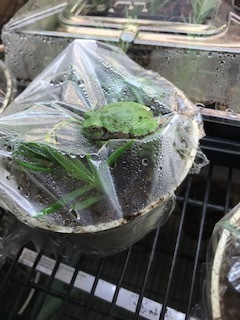 I found him perched on top of the saran wrap keeping my new cuttings moist. Welcome back!